Today is the start of Blogoberfest over at "I saw you Dance". I am committing to blog every day this month. So to kick it off, I have my pumpkins on the design wall in Halloween style. I got started on this Saturday morning and worked on them again yesterday. I am think they will be place mats. I am hoping to finish them soon. However I am having machine trouble. I have been stitching on my featherweight and thought I would oil it. Now the tension is wacky. I am starting to think the timing is out. I had a number of threads in behind the bobbin case. I keep getting loops on the bottom. No matter what I do to the tension setting. The machine sounds better. I may have to get out a different machine to sew. Edited at noon hour: I got it working correctly. I had taken the plate off the bed to clean around the feed dogs and did not get the hook in the correct place when I put it together. Surprised it would even sew at all. Now I am happy it sounds and runs so much better. Some one asked "you have more machines? yes I have 8 machines in total if I count all of them. 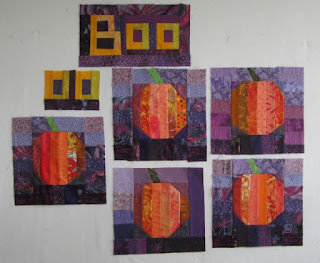 I have added today's post to Patchwork Times Design Wall Monday. I looked back at Sept's goals I did OK. For Oct here we go. 1) In Sept I got my Spider Wed quilt top all pieced together. For Oct I need to get the backing done. 2) Adam's quilt work on at Retreat. I find my FW is a little finicky too, especially the bobbin. I realized my new bobbins were slightly taller than the original ones and therefore didn't fit in the bobbin case perfectly. what thread are you using? My FW hates Aurifil, which is my favourite thread otherwise, so I use Coats dual duty in it. Super cute blocks! I found you through blogtoberfest - enjoy the rest of the month! love the pumpkins, sounds like a good plan for the month, maybe I'll make a list too, thanks for the inspiration. Love your pumpkin blocks. What fun placemats they will make. Hope your machine settles down. Those pumpkins are just wonderful!! Glad to hear you got the machine running again and wasn't anything serious. Love the blogfest idea but first I have to start a blog! My featherweight was very noisy, so I finally broke down and had it serviced, it runs like a dream now. Happy sewing!